That’s what everyone keeps saying. But how is it possible for a hunk of meat that’s been simmering in ancient spaghetti sauce for thirty-three years to know anything, never mind who Lena Tortellani is supposed to marry? She won’t do it. They can’t make her do it. No matter how good that gravy smells or how powerful the matchmaker is, this witch is not eating that meatball. 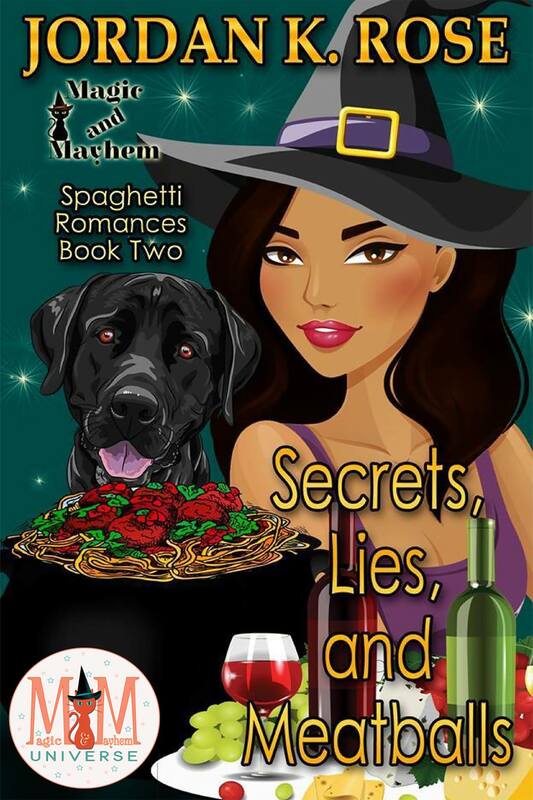 But when someone steals the mate-ball to Lena’s meatball, the lid is blown off a pot of family secrets kept hidden for some fifty years. And the only way to save the people she loves most is for Lena to eat the magic meatball or risk losing her family forever. “I’m here!” Lena Tortellani banged through the door of her parents’ home, tossing her bags onto the nearby chair and pausing to inhale the wonderful aroma of slow-cooked spaghetti sauce wafting from the kitchen. “Oh, the gravy smells so good.” One of the best things about coming over for Sunday dinner was the smell. “Don’t mind, if I do.” The black feline rolled onto his back to catch the incoming snack. The glorious scent of Sunday dinner beckoned Lena toward the kitchen where she knew fresh made pasta, an antipasto to rival any high-end Italian restaurant, and bottles of Dad’s homemade wine waited. She ripped a piece of freshly baked bread from the loaf she’d bought at Rappinelli’s. The bakery made the best bread in town. Voices chattered, yelled was a better description, from the kitchen, cluing Lena in to the fact her family may have already started dinner. With bread in dunking position she headed toward the sounds of her family and the smell of the perfect meal. “Mmm. I smell basil and pepperoni. Dad made the wood-fired pizza, didn’t he?” she asked Nero, her mother’s familiar. Ralph was Lena’s older-by-thirteen-seconds twin brother. They’d been in a constant rush to beat each other since conception, and she’d always been annoyed he came out first, a fact he enjoyed pointing out at regular intervals. “You know, there is nothing like bread fresh out of the oven.” Lena ate the end of the still warm loaf. “I’m going to make a meatball sandwich with this piece. I’ve been craving one all day. That spaghetti sauce smells scrumptious.” She held up the other half. The voices beyond the door separating the living room from the giant eat-in kitchen grew louder. It wasn’t unusual for a little Sunday afternoon argument to brew. The Tortellanis, at least this side of the family, weren’t known for their agreements. They liked to argue for the sheer sake of arguing. So, one more argument sounded about right. “That’s not what I said!” Nonna yelled. “Yes, it is!” Ralph hollered. “Don’t yell at your nonna,” Lena’s mother said in her usual soft-spoken voice. “One! One meatball, that’s all! No one needs more than one meatball!” she hollered. “Ma, calm down,” Lena’s dad, Giacomo said. “What? Just like your father!” Nonna yelled. Whomp! “What’s happening?” Lena stopped short. Something about the intensity of Nonna’s voice told Lena there was a problem. Maybe it was more than the intensity. It might have been the topic. Certain meatballs were sacred as far as Nonna was concerned. If Nero was telling the truth, (which he was known not to do on occasion so there was still some hope) these magic meatballs would turn Lena’s happy life into a disastrous mess. Nero grinned, and the little black cat Lena had once loved took on the appearance of a panther on the prowl. “Oh, the meatballs are ready.” He tossed back his head and laughed, and Lena was happy to see him lose his balance and fall off the back of the couch. “I’m fine.” He jumped back into place. “Now, what fun would that have been?” Nero’s tail swished.